Anthony as Elmo, originally uploaded by misspudding. Anthony's school had a carnival this weekend. They had lots of sugary snacks and games. Anthony was the lucky winner of a goldfish, too! He had so much fun at the carnival and even more fun at the pet store, later on, picking out gravel (fruity, neon colors) and habitat for his new little friend. The fish is named Sally, though we have no clue as to whether it is a boy or girl (won't know until it's about a year old). 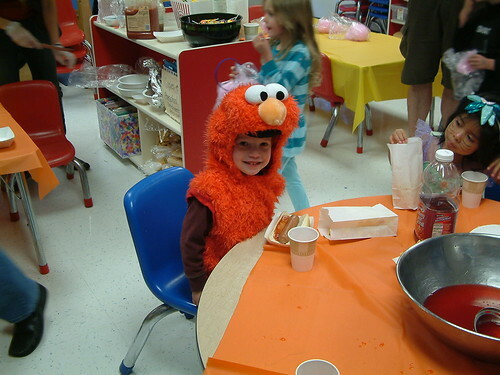 As you can see, Elmo is Anthony's costume for Halloween this year, which is Friday! Hard to believe it's coming up so soon! This is the first year that Anthony's really been excited about it. He is absolutely looking forward to it.